The first time I ever made homemade marshmallows was a failure. I didn’t have a Kitchen-Aid back then, or even a hand-mixer and my arms got very, very tired. I whisked and whisked and whisked and whisked, but my marshmallows never got fluffy. I realized pretty quickly that it was more to do with the temperature I cooked the sugar at rather than my poor whisking skills so I made a second batch and they were glorious. They were for a friend who was obsessed with toasted coconut marshmallows and she absolutely loved them. After that first time, I was hooked. Candy making is amazing – like magic. All you need is a bit of sugar and gelatin and you can make homemade marshmallows. They’re so much softer and fluffier than store bought. And, you can make them into any shape you want! I was giggling to myself the entire time I made these snowman faces. I couldn’t get over how cute they came out! And they were even cuter after melting a bit in cups of hot chocolate. So delicious. Of course, if you don’t have the time to make marshmallows from scratch, you can go ahead and cut up some store-bought marshmallows with a pair of scissors, dip the sticky sides into a bit of icing sugar, and then pipe on the faces. 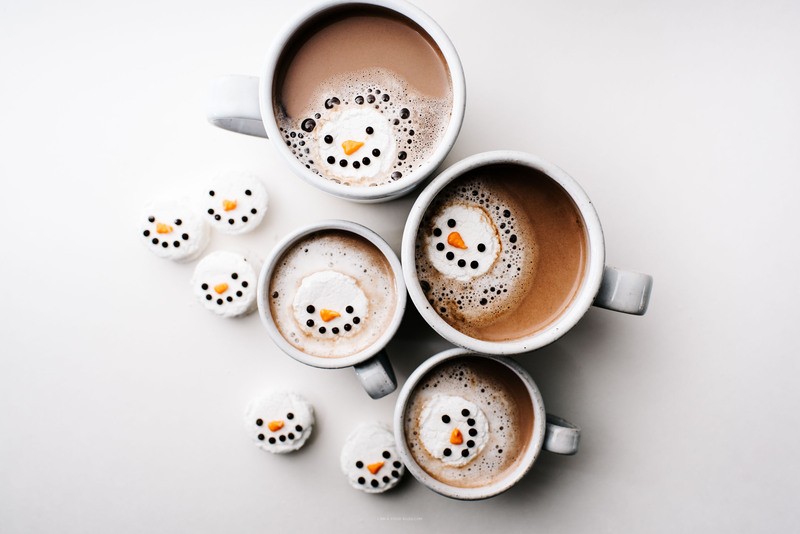 Regardless of how you do this, I hope you will because you need a little snowman face peeking out of your hot chocolate! Update: Enter the giveaway right here! Oil a 9-inch square pan or glass baking dish with non-stick spray and lightly dust with powdered sugar. In a small bowl, soak the gelatin in 1/4 cup cold water. Set aside. Place the remaining 1/4 cup of water and sugar in a pot and stir to dissolve over medium heat. Add the gelatin and bring to a hard boil, without stirring, for one minute or until it reaches 240°F. Carefully remove from the heat and pour in to a bowl of an electric mixture. Let stand for 5 minutes. Stir in the salt and peppermint extract. Beat with the whisk attachment of the electric mixer on low for 2 minutes then increase to high until soft and doubled in volume, about 10-15 minutes. Pour into the prepared pan and smooth with a offset spatula. Cool in the pan uncovered, until firm, minimum 3 hours. Lightly dust the top with sifted powdered sugar. 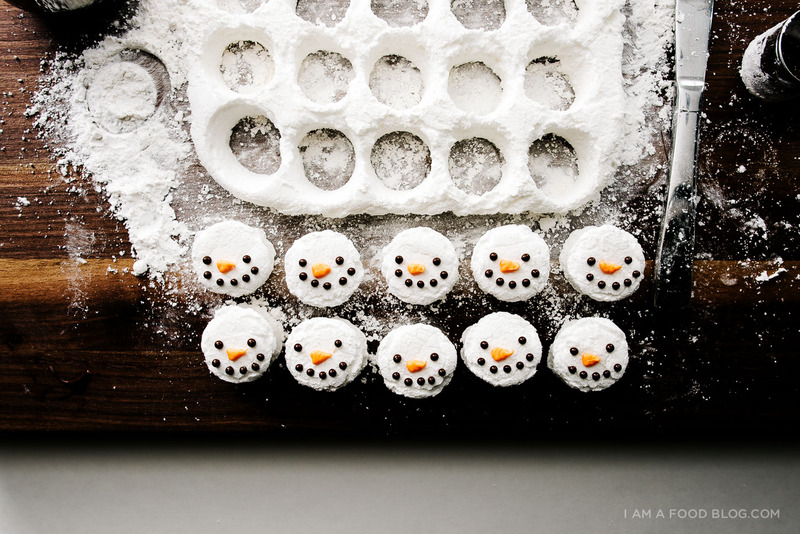 Snowman faces inspired by this creative lady: Sweet Sugar Belle! these are adorable! i made a pan of plain cubed marshmallows once, and they didn’t excite me. 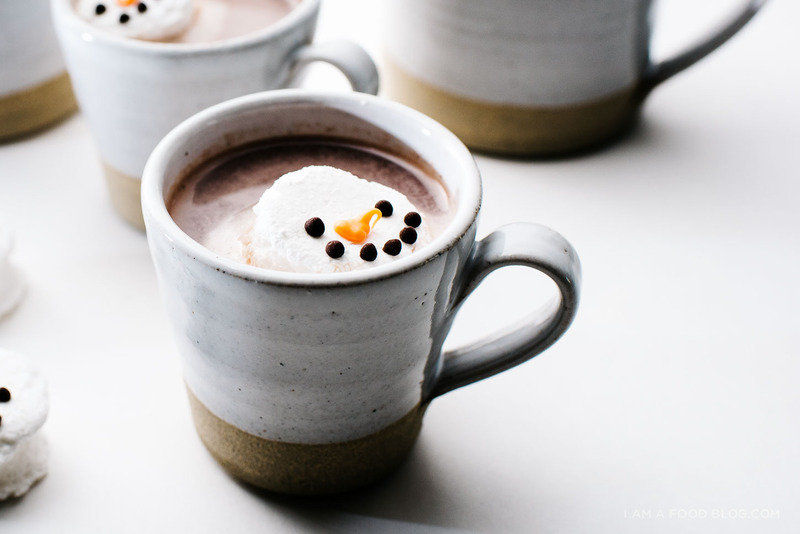 but after seeing these and hearing about all the amazing ways you can flavor them, i’m going to have to try them out again (: and i bet these would be super impressive for a gift with a side of homemade hot chocolate mix! Whaaaa?? This is so gorgeous!! And creative girl. Love, love, love! Well these are basically the cutest thing I’ve ever seen! these are unbelievably cute! I’ve never made homemade marshmallows but you may have just inspired me to try :) I love their little faces so much! dear. god. i can’t handle this cuteness!!!! DYING!!!! I love these! Definitely going to make them. I’m wondering about storing the extras. Would you recommend eating them the day of, or can you store them in an airtight container for a few days with them still tasting good? Wow! Omg! That’s such a great idea! They look amazing! Haha these marshmallows make me laugh! These are just so adorable and so creative. I’m not courageous enough to make my own marshmallows but I really should just do it to cross if off my bucket list! AH! So cute. I can barely handle it. These pictures are amazing! Too cute! I am looking to start my own food blog, an was wondering do you recommend spending the money on a logo and website design when your first starting out?? So cute and looks yummy! I’m dying. These are adorable!!! Do you think a hand held electric mixer/beater thing work just as well? a handheld will work, just make sure you beat it long enough! the melting little snowman faces are the best. Would these be difficult to package up individually for presents? i think they would package up nicely! if you’re concerned about the freshness of the marshmallows, i recommend using store bought, cut in half with the sticky side lightly dusted with icing sugar. store bought marshmallows tend to stay soft for a lot longer than homemade. hope that helps! Jam having trouble getting chocolate to stick to marshmallows due to the icing sugar… Ideas? maybe there’s too much icing sugar on the surface of the marshmallows? it should be just a light dusting, you should barely be able to feel it, it’s just to take the stickiness off. PS SMART CALL on orange candy melts as noses!! Adorable! These are perfect for kids AND adults! These are so cute! The way it is shown, it looks easy! I’m sure I might struggle to make the little snowman faces, but it definitely seems worth it. 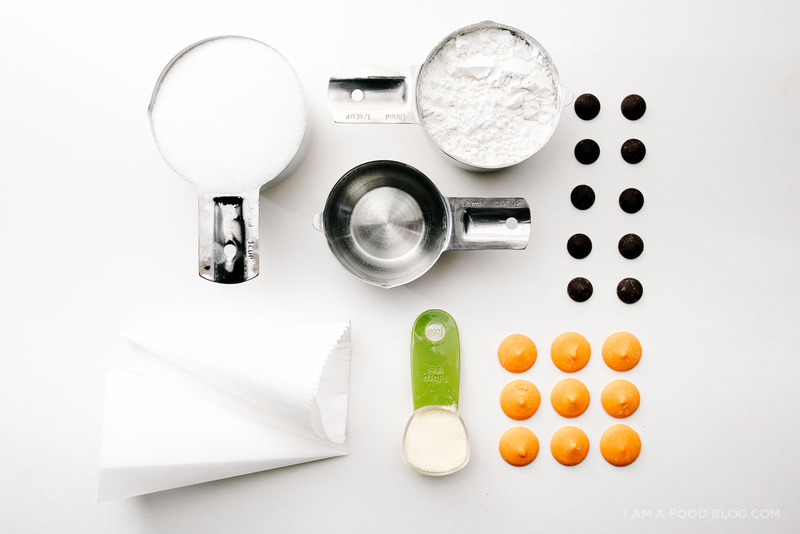 Next time I plan to make something, I’ll definitely consider this recipe! I am very excited to try this recipe this coming winter months! Favorite Christmas and/or memory? Newly married, husband and I visited my aunt and uncle in NY on Christmas Eve. Uncle was dying (even ill, he’d taken me up the altar past May wedding), aunt was elderly, and they had no tree up. My aunt said it was too much trouble to put up, and esp. take down. Husband and I went looking for a tree later that night, and finally found a somewhat ragged one selling for a pittance. We decorated that eve, had a lovely Christmas, and took it down before we left for home. My uncle died soon thereafter. I think often of that 1976 Christmas. Great idea! Saw this on Pinterest but didn’t know it was you who created the marshmallows. Gonna give this a shot. Kids will be delighted. Super photos. How stinkin CUTE !!!! Can’t wait to make these over the holidays. MERRY CHRISTMAS !!!! Just in time for the holidays! The orange nose is so cuteeeeee! My favorite Christmas memory is from every Christmas morning of my childhood. At our house Santa put ALL the gifts under the tree, ones from family members were wrapped of course and the one from Santa was unwrapped. We went to bed on Christmas eve and there wasn’t a gift in sight but when we came down on Christmas morning gifts were spilling out in to the living room…it was magical! I still love that sight when I come down on Christmas morning in my own home! Whoa. Crazy mad props to you for hand whisking your first marshmallows! I can barely whisk whipped cream by hand. Will def try your marshmallow recipe because you don’t use corn syrup. Curious to see how the texture or taste is different from what I’ve been doing. Thanks for the inspiration & recipe. 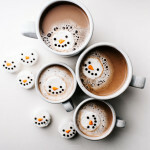 Cute hot chocolate snowmen! Can u make marshmallows without gelatin for vegetarians? 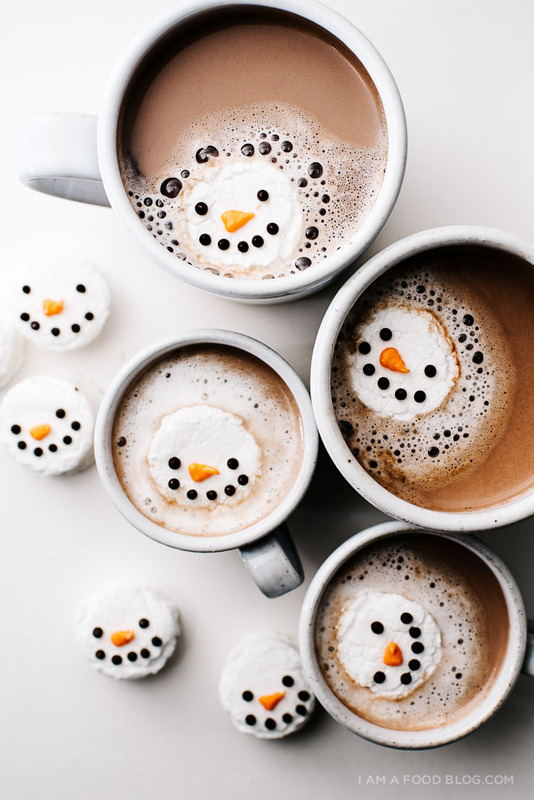 i haven’t tried – i have had store bought vegetarian marshmallows and they aren’t quite the same, but you could buy veggie ones and decorate them! These are so cute! Your photography is beautiful! 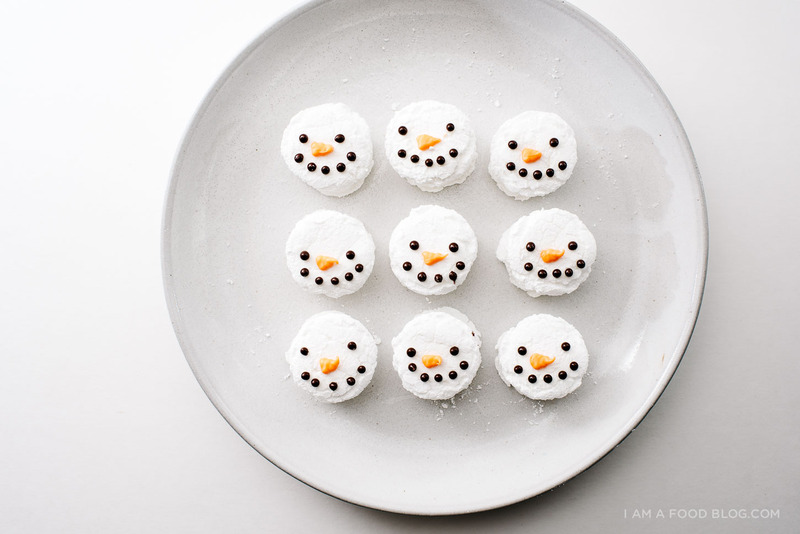 omg these mint snowman marshmallows look soo adorable!! I have to test them out soon!! Thank you for this wonderful recipe! Wow these are so cute and probably very tasty! Plus they seem pretty simple. Like you said just a few ingredients and you can make your own homemade candy. I’ll definitely be trying these out in some delicious hot chocolate. I can’t wait to see how they come out. Thanks for the great recipe! Help! I need detailed instructions on how to make the snowmen faces. Thanks! melt your chocolate and put into a piping bag or ziplock bag. cut off the tip, you only want a very small hole. pipe on dots for eyes and dots for a smile. melt the orange candy melts and put into a piping bag or ziplock bag. cut off the tip and pipe out orange triangles. hope that helps! Will these freeze? I have a Christmas party on Sunday and only have time to make them tonight!